Synthetic peptide conjugated to KLH derived from within residues 300 - 400 of Human c-Kit. This antibody gave a positive signal in the following whole cell lysates: A431 treated with EGF; K562; MOLT4. Our Abpromise guarantee covers the use of ab46758 in the following tested applications. WB Use a concentration of 1 µg/ml. Detects a band of approximately 145 kDa (predicted molecular weight: 110 kDa). C-Kit contains a number of potential glycosylation sites (SwissProt) which may explain its migration at a higher molecular weight than predicted. ab46758 has not yet been referenced specifically in any publications. Publishing research using ab46758? Please let us know so that we can cite the reference in this datasheet. I have decided to take part in your testing discount program to test ab46758(Anti-c-kit antibody) in flow cytometry and IF. Ifyou do not have relevant empirical data,I would like very much to testthem in IF and submit feedback to you. Pleasegive meDISCOUNT CODE of these antibodys. Unfortunately, the immunogen of ab1671 shows less than 60% homology with dog and therefore we do not expect a crpss-raction of this antibody. ab63851 does show a 93% homology with dog and would in general be eligable for the testing discount programme. But in this case ab11370 is the better choice since it shows 100% homology with dog and reacts also with Connexin 43 / GJA. I am very pleased to hear you would like to accept our offer and test ab46758 in ICC/IF. This code will give you 1 freeprimary antibodybefore the expiration date. To redeem this offer, please submit an Abreview for ICC/IF and include this code in the “Additional Comments” section so we know the Abreview is for this promotion. For more information on how to submit an Abreview, please visit the site: www.abcam.com/Abreviews. I am very pleased to hear you would like to accept our offer and testthe above mentionend antibodiesin dog. This code will give you 1 freeprimary antibody per dicount code/tested antiboybefore the expiration date. To redeem this offer, please submit an Abreview for dog and include this code in the “Additional Comments” section so we know the Abreview is for this promotion. For more information on how to submit an Abreview, please visit the site: www.abcam.com/Abreviews. 1. 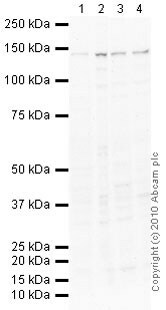 Anti-c-Kit antibody (ab46758) is only used for WB? Can I use it for Flow Cyt or ICC/IF? 2. Does Anti-CXCR4 antibody (ab2074) reactwith Dog or Pig? Thank you very much for your help! Thank you very much for your interest in ab2074 and ab46758. Unfortunately, the immunogen from ab2074 (Anti-CXCR4 antibody) shows only 71% homology to pig and dog and the antibody is therefore very unlikely to cross-react with pig or dog. To our knowledge, ab46758 (Anti-c-Kit antibody)has not been tested in flow cytometry and ICC. Therefore, I can offer a discount off a future purchase if you buy ab46758 now, test it inflow cytometry and/or ICC and submit feedback to us in the form of an Abreview. It doesn’t matter whether the Abreview is positive or negative, we would just really like to receive your feedback. The discount would be to the value of 1 freeprimary antibody. If you are interested in this offer, please follow these steps: 1. Reply to this e-mail to let me know that you would like to proceed and test ab46758 inflow cytometry and/or ICC. I will then send a discount code. This code must be issued before purchasingab46758so please wait for my reply before ordering. 2. Purchaseab46758 either by phone, fax, or online (www.abcam.com). 3. Test it in flow cytometry and/or ICC. 4. Let us know the results, positive or negative, using our Abreview system (this will take about 10 minutes and images are great if you have them!). To find out how to submit an Abreview, please visit: https://www.abcam.com/abreviews. 5. After the review is submitted to us, the discount code becomes active. Simply place your new order by phone, fax, or on the web and mention the discount code. The discount can be redeemed for anyprimary antibodyordered and the discount code is valid for 4 months after issue. We are always pleased to obtain feedback about our products and any information is greatly appreciated! Evenifab46758 turns out to be unsuitable forflow cytometry and/or ICC, you will still receive the discount on your next purchase after your Abreview has been submitted. Please let me know if you have any questions about this offer and I would be happy to help you further. The Terms and Conditions of this offer can be found at: www.abcam.com/collaborationdiscount.